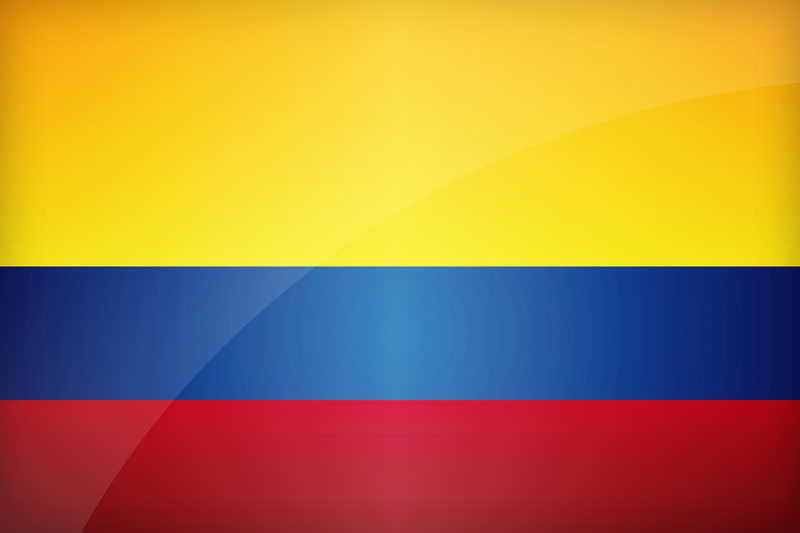 The flag of Colombia was adopted in 1861. It consists in three horizontal stripes, yellow, blue and red. The yellow band is twice as wide as the other two ones. Like many flags that use red, it refers to the blood shed by the Colombians for independence and freedom. Yellow, as in Brazilian�s flag, represents the country's mineral wealth, mostly gold. Blue evokes the two oceans, Atlantic and Pacific, along the shore of the country. Another explanation, more satirical, says that yellow represents gold, while the blue and red colours represent the two most influential parties in the country, which share this wealth. General Francisco de Miranda is at the origin of the tricolour composition and the use of primary colors for the development of Latino-American flags as a sign of independence. The Colombian flag has not really changed over time, from Great Colombia (which annexed Venezuela and Ecuador), to New Granada, the colours remained the same. You can download it in different sizes, in a decidedly modern design for your personal use, or for wider use. Colombia's flag is available in 4 different sizes. Keywords: Flag colombia wallpaper, Colombian, Republic of Colombia, National colombian flag, banner, pictogram, country, icon, Colombia icon, international, Bogotá, Bogotá, Medellín, Cali, South America. This page has been viewed 8230 times.